This item is no longer available, check out our all new Delock FireWire 800 to UDMA CompactFlash Drive Read-Writer! Synchrotech's CFFire800 Pro FireWire 800 to UDMA CompactFlash Drive Read-Writer is a must for pro photographers and other demanding users of high speed CompactFlash memory cards. Capable of exploiting the high speeds of the latest generation of CompactFlash memory cards, the CFFire800 FireWire 800 boasts incredible read speeds of up to 43MBs with Lexar's new UDMA 300X and 39MBs with SanDisk's Extreme IV CompactFlash cards. The CFFire800 FireWire 800 to CompactFlash Drive reader supports all the latest high-speed CompactFlash standards including PIO Modes 1-4, DMA Modes 0-2, and UDMA Modes 0-6. CFFire800 features a single CompactFlash slot for CompactFlash Type I and II including Hitachi Microdrives and other CFII+ rotating media. It supports FireWire 800 (and 400 with and optionally purchased adapter) connectivity on both Macintosh and Windows Operating Systems. 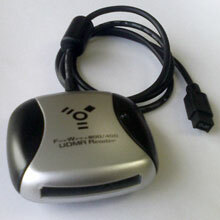 The FireWire to CompactFlash uses FireWire bus power, so the CFFire800 reader plugs and plays with no external AC power. CFFire800 Pro FireWire 800 to CompactFlash Drive requires no drivers and comes with a one year limited warranty. Story of how Synchrotech innovated a two headed UDMA CompactFlash reader solution for sports photographers using a MacBook Pro in the field. Benchmarks demonstrating the wide gulf in speeds between high performance buses and lower performing buses when accessing data on UDMA enabled CompactFlash Cards. As with benchmarks comparing hard disk drives, FireWire consistently beats out USB 2.0 by significant margins for read and write speeds to mass storage devices. With recent UDMA CompactFlash reaching throughputs of Ultra ATA/133 (UDMA 6), choosing an appropriate CompactFlash reader to take advantage of such speeds is mission critical. A review and comparison shows FireWire 800 and FireWire 400 based card readers doubling throughput of the best USB 2.0 readers.